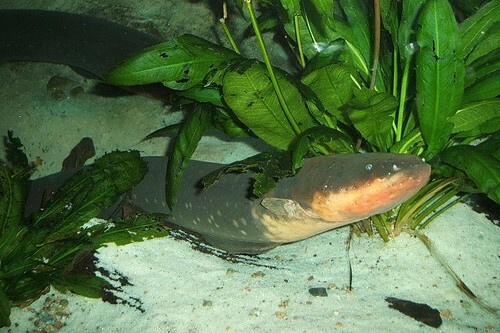 The electric eels - a type of knifefish - are capable of generating powerful electric shocks of up to around 600 volts. They use it for both hunting and self-defense. 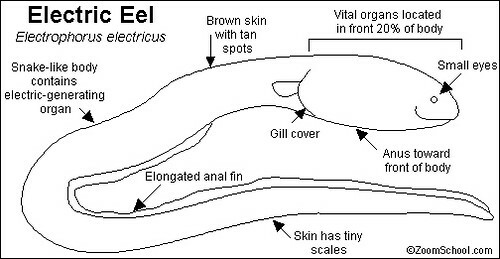 The source of their power is a battery-like array of cells known as electrocytes, which make up around 80% of the eel's metre-long body. These disc-shaped electricity producing cells each acquire a small potential difference of around 1/10th of a volt by controlling the flow of sodium and potassium ions across the cell membranes. When linked together in arrays of thousands of individual cells, the result is a kind of natural car battery, which releases its charge when the eel spots predators or prey. Up to 500 Watt (think about the portable gasoline generator you have at home) of electric power is released per shock. That sort of power is enough to inflict significant injury on a human.